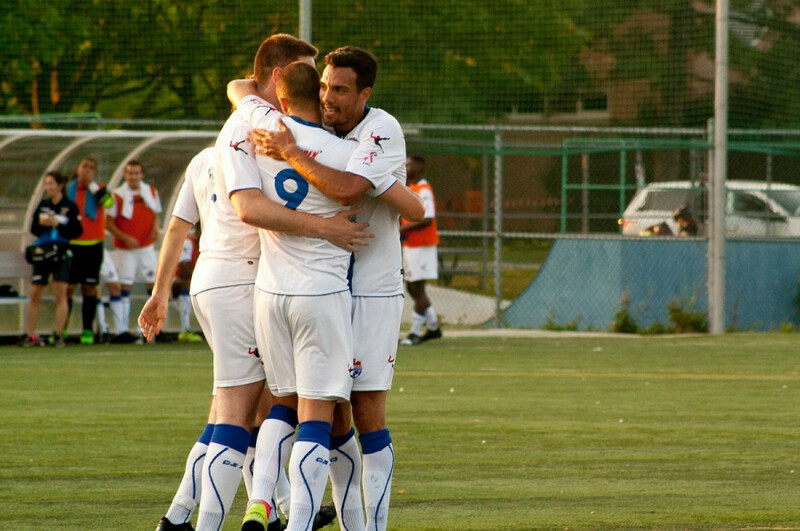 It was a performance that Club de Soccer Mont-Royal Outremont Griffons head coach Luc Brutus has been wanting to see all season. After nearly four weeks off, CSMRO find themselves winners of back-to-back games. The first coming against FC Gatineau and, most recently, AS Blainville on Sunday night at home. Coming up against the first place team in the league, CSMRO showed no signs of backing down. Griffons took the game to the opposition, turning in strong performances both offensively and defensively enroute to a 3-2 victory. Despite going down by a goal early in the first half courtesy of Blainville’s Nicolas Bertrand, Griffons confidence didn’t waver and their patience would soon pay off. Earning a penalty kick midway through the first half, Griffons striker Frederico Moojen converted to tie the game at one a piece, marking his 100th career goal in the Première ligue de soccer du Québec in the process. It wouldn’t take long for Moojen to score goals 101 and 102 in the same match, completing the hat trick. Happy to reach such a feat, Moojen credited the team’s overall performance for the win. Brutus and the team credit the last two wins to the changes made by the coaching staff during their time away from the pitch. One notable adjustment was bringing Stephen Meterissian back into the fold on defence, and inserting Renan Dias back at midfield. The switch in formation favoured Dias as he was able to push higher up the field, while also tracking back to fulfill his defensive duties. It was clear the tactical switches paid off for Brutus and the team. Rosa flourished throughout the contest, putting in a dominant display on both ends of the field. Rosa’s overall performance allowed the team to open up offensively. His creativity and speed on the ball allowed for CSMRO to create several offensive opportunities—something that’s been rather difficult for the team this year. Rosa also put in an energetic display on the defensive end of the field, thwarting any opposing offensive opportunity in the process. “Today we knew we needed something big and to score three goals and create many more against [Blainville] who have been a good team it’s a big confidence boost for us, so everybody better watch out now,” said Rosa. His performance didn’t go unnoticed, as Brutus was quick to praise Rosa after the victory, highlighting his importance to the team. The Griffons now sit just three point behind league leaders Blainville, and will look to seal a third consecutive win against CS St-Hubert this Saturday.